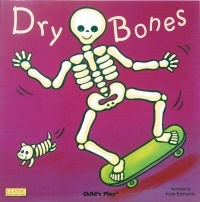 Great for singing along to, this traditional African-American Spiritual is a fun introduction to the parts of the body, as well as the concept of the skeleton. Ingenious die-cut holes on every page help us to recognize and identify the different parts of the body and how they join up. Bouncy illustrations, innovative die cutting and popular rhymes make Books with Holes a must for every child. Available in three formats, suitable for babies, toddlers, pre-schoolers and the nursery or classroom.